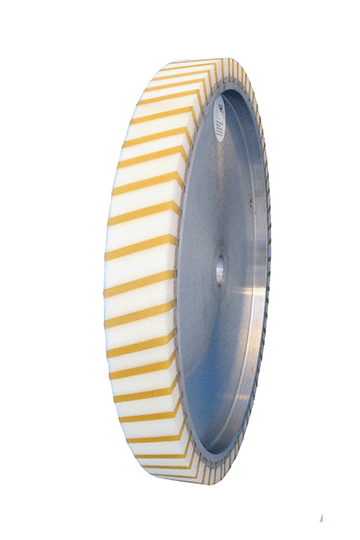 Uniformly wide lamellae of foamed up Vulkollan® are attached in precisely established spacing while plastic foam lamellae are attached in the spaces between them to the aluminium hub of the frequency damped contact wheel FAPI-KS/V FREQUENCY DAMPED. The height of the coating or the length of the lamellae of foamed up Vulkollan® and plastic foam can be varied depending on the application (standard: 25 mm). The positioning of the lamellae dampens the howling sounds in the upper frequency range generated during grinding so that they are no longer audible to the human ear. The contact wheel FAPI-KS/V FREQUENCY DAMPED achieves a significant reduction of the noise level in the workplace and so contributes its share to work safety. 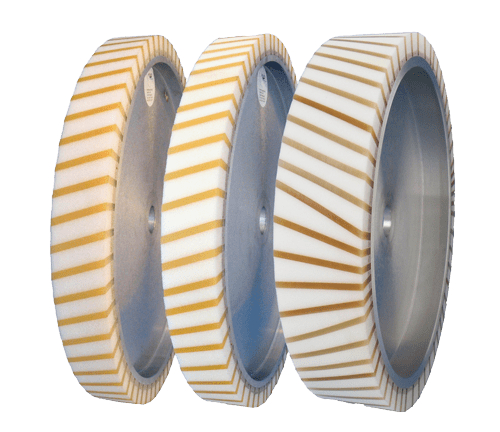 Because of their lamellae of foamed up Vulkollan® and plastic foam, contact wheels of the FAPI-KS/V – series are extremely aggressive contact wheels. Because of these outstanding properties, contact wheels of the FAPI-KS/V – series have proven themselves in the market over decades. The FAPI-KS/V – series continues to play an outstanding role even with our newest developments. The contact wheel FAPI-KS/V FREQUENCY DAMPED is used in particular when high abrasion is required in a short time (for example for surface grinding). But even lightly rounded workpieces can be ground without difficulty using this contact wheel. The hardness of the lamellae of foamed up Vulkollan® can be differentiated into three levels. The spectrum extends here from a medium soft lamellae of foamed up Vulkollan® with 60º Shore (A) to an extra hard lamellae of foamed up Vulkollan® with 90º Shore (A). The correct lamella hardness always depends on the individual application.